One of the things I appreciate about the Proverbs 31 studies is that these women are not afraid to ask tough questions and they expect honest answers – from themselves as well as study participants. It’s refreshing to be part of a community where we are able to be brutally honest and allow God to change us, while being supported and encouraged. I find this very empowering. Excuses don’t cut it. Only the truth. “My people have sinned twice. even though I am the spring of water that gives life. And they have dug their own wells. But those wells are broken. They can’t hold any water. Isn’t it ironic that we turn away from the almighty, loving, perfect God who created us and try to fill our emptiness with created things that don’t last, hurt us, and leave us in worse shape than we were before? How can we be so foolish? Thankfully, God understands that we are prone to sin and He waits for us to repent and come back to Him. He is the only one who can truly empower us. 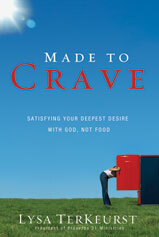 As I begin this study, I choose to turn away from relying on food and people to relying on God. In and of themselves, these things are not bad. It’s my reliance on them that is wrong. I confess my sin of relying on “broken wells” and choose to rely on God today. What about you? Are you trusting food, people, money? Or are you choosing to be empowered by God? Ruth just loved your blog and this “Each time I craved something I knew wasn’t part of my plan, I used that craving as a prompt to pray. I craved a lot. So, I found myself praying a lot” I think that is a great way to be trusting God to empower us knowing we need to crave Him more than whatever we are craving that is not Him. Thanks for sharing . Marilyn, thanks for stopping by and encouraging me. It’s funny how we think change needs to be something drastic, but often it’s the little choices we make during the day that make a huge difference. “‘we turn away from the almighty, loving, perfect God who created us and try to fill our emptiness with created things that don’t last” Isn’t that just the truth? We “rational” beings get so wound up in our own little circle, we forget that rationally speaking, going to the One Who created us to fill us is the wisest decision we could ever make! Thanks for stopping by and leaving a comment, Jenn. It has been said that we all have a “God-shaped” hole in our hearts. Nothing else will fill that emptiness except God, no matter how hard we try!